I PARKED my car in what was once Hitler's driveway, and tried to find the house. It wasn't easy. Not much remains of the mansion that Hitler built for himself on Obersalzberg Mountain, overlooking the town of Berchtesgaden. The driveway is completely blocked and overgrown with trees. By climbing a steep bank, I was able to get to the only part of the house that remains — a corner of the garage. The concrete was moldering and the bricks had crumbled. Anything portable had long ago been carried off by souvenir hunters. Of the once magnificent house nothing is left except a few concrete blocks, and one or two iron ventilation shafts. No "echoes of the past" were there. There was none of the feeling of past grandeur that one gets when visiting an old castle or palace. It was a dead, dead place! This mountain was once a nerve center for the Third Reich. It was here that Hitler finished writing Mein Kampf, and came to love the area. Quite understandable — not many places in the world can rival Berchtesgaden for sheer grandeur of scenery. When they came to power, the top Nazis took over the entire mountain, evicting the former residents and building for themselves a mountain fortress resort. Martin Borman built himself a house here, as did Hermann Goering. A barracks was built to house the elite S.S. regiments that were assigned to permanent guard duty. A small hotel was enlarged to provide accommodation for visitors, and a guest house was requisitioned for the Gestapo. And later, when the tide of war turned against the Nazis, they excavated a remarkable complex of tunnels — a virtual city underground — to protect themselves in case of air raids. The raids came in 1945, a month before the end of the war. The buildings on the Obersalzberg were badly damaged. The victorious Allied armies and the German people themselves demolished the rest after the ending of hostilities. Of Borman's and Goering's houses, not a trace remains — not so much as a pebble. The S.S. barracks are now a soccer field. The hotel built for top Nazis was slated for destruction, but at the last moment the American army decided to remodel it as a recreation center for the U.S. forces stationed in Europe — a function it still serves. The Gestapo headquarters became once again a comfortable guest house. The underground tunnel system is still there, of course, and can be visited, if you know where to go and whom to ask. But that information is not always easy to get. Very little effort has been made by the German government to turn the Nazi past of Obersalzberg into a tourist attraction. It is the same at Dachau, the little town outside of Munich where the first concentration camp was established in 1933. The camp is still there, on the outskirts of the town — preserved as a museum. But the local people are very reluctant to give directions. "Why," a mayor of Dachau has asked, "when our town has been a center for music, art and painting for several centuries, are we only remembered for what went on here between 1933 and 1945?" Many residents in Dachau would like to see the camp torn down. One can understand their point. The war ended nearly 40 years ago. Most Germans alive today played no active part in the Nazi years. Indeed, the majority of West Germans were not even born when Hitler died as his "thousand year Reich" crashed around him. Older Germans know the terrible price their country paid for following him. In the last months of war, Allied bombers pounded German cities to rubble. And when surrender came, the Allies decided that Germany would never again be a threat to anyone. Any German industry that survived the bombing was systematically dismantled. Whole factories were shipped to the Soviet Union, France and other nations that had suffered from Nazi aggression. What couldn't be moved was blown up. It was decided the Germany henceforth would be a third-rate, agricultural nation, closely guarded by her conquerors. Never again would German — military and industrial power threaten anyone. The once proud Reich was split into four zones ruled respectively by the American, Russians, French and British. The economy collapsed, and starvation and deprivation were the way of life for the shattered land. For three years after the war, life was misery for the demoralized and defeated Germans. Then came the Cold War, the falling out of the wartime allies, the Berlin blockade and the Korean War. Suddenly America, France and Britain realized that they needed their now prostrate former enemy — as an ally. And so, following currency reform in 1948, and with the help of the Marshall Plan, Germany began the climb out of the abyss. Never had the world seen anything quite like the Wirchtschaftwunder (economic miracle) of the next few years. Some had predicted that it would take 150 years for the broken nation to recover even a semblance of prosperity. Yet in just one astonishing generation, West Germany once again became the leading industrial power in Europe, with one of the best equipped and well-trained armies in the world. And for the last two decades, the Germans have proven to be firm and capable partners in the NATO alliance. The Fuehrer would indeed be astonished if he could now see the land that he once bequeathed to ruin. What a nation it is! The great cities have been rebuilt, and today are linked with magnificent highways and some of the best railroads in the world. Great bridges span the mighty rivers crammed with barges and ships carrying the fruit of the German industrial machine to the world. Never in their history have the German people been so prosperous, well fed, well housed — or, one suspects, so content. The new Germany holds no grudges. It seeks to regain no "lost territories." To many young Germans, even "reunification with East Germany" is no longer an issue. As for Nazism — except for a few — that is firmly in the past. So why not tear down the last few remaining relics of Germany's darkest hour? But perhaps those ruins on Obersalzberg, the camp at Dachau and the battered old review stand on the parade ground at Nuremberg should be left there for just a little longer. For they stand as a reminder. They show how a nation — even a great and talented nation — can make a mistake. If that mistake would never be made again, then by all means consign the Nazi ruins to the trash can of history. But such is not the case. Not just Germany but all of Europe needs to be reminded that 50 years ago, a great people were seduced by a lie. Adolf Hitler had promised his people a Reich or kingdom that would last for a thousand years. Older Germans admit that (providing you went along with the system) there were some good years under Hitler. The man and his policies did solve some of the problems that plagued the Germany of the 1920s — such as unemployment, inflation and lack of direction in the young. Then came the war, and the myth of the "thousand year Reich" finally fell apart. West Germany, since 1948, has shown that the way to power and national greatness need not be by conquest and aggression. Far more has been achieved by hard work, inventiveness and productivity. The Germany of today shows the greatness and potential of her people far better than did the pomp, vanity and brutality of the Nazi years. All European nations should have learned this lesson. Not just Germany, but all Western Europe is a remarkable achievement, considering how it was wrecked and ruined less than 40 years ago. Since the war ended, the various nations have lived at peace with one another for the longest period in history. Their Common Market has not always been sweetness and light, but at least former enemies have tried to tear down economic barriers rather than put up military ones. Europe today is more prosperous than ever before. And most Europeans want nothing more than that prosperity to continue. They don't want war. They don't want nuclear weapons on their soil. They don't want to fight and die for their country, or anybody else's. These have been good times — let the good times continue. But unfortunately, for many in Europe the good times are fading fast. Inflation has eroded even the strongest currencies. Unemployment is reaching chronic levels. And no remedies are in sight. It has been suggested, especially in Holland, that some young people now leaving school will never have a job! There are disturbing parallels between the situation today and the chain of events that swept Hitler to power in the 1930s. Only this time, it is not just one nation that is involved. The nations of Western Europe collectively are in trouble. And it is collectively that they will look for a way out. For centuries, visionary statesmen have seen the logic of the individual European nations uniting to become one giant superstate. The idea looks good on paper, but has proven much harder to put into practice. It isn't the same situation as a United States of America. In the 18th century, the 13 American colonies, with a short history and a common language, found it relatively easy to unite — in the face of a common threat. But the histories of European nations go back millennia. Individual linguistic, cultural and religious roots run deep. The prophecies of the Bible show that a brief period of unity is coming. In the face of a common (economic) threat major nations in Europe will give up their sovereignty to become that most unlikely of unions — a United States of Europe. It won't be an easy marriage, for individual traditions and aspirations die hard. The Bible calls it "iron mixed with miry clay." But under dynamic and charismatic political and religious leaders (yet to emerge), a shaky union will be forged. When it happens, it will seem like a good idea. It may well come into being with best of intentions. Many will rejoice, for they will see in this union a solution to the problems that are plaguing the Continent. And as with the Third Reich, there may well be some "good years" for those who go along with the system. But the United States of Europe will end as a terrible mistake. In giving up their sovereignty to a supranational power, these nations will eventually plunge themselves, and the rest of the world, into a crisis more terrible than anything that has ever been seen before. Tragically, the pulsating, energetic, dynamic powerhouse that is Europe, with its modern buildings, its state-of-the-art communications networks, its millions of educated and talented people that have so much to offer, is once again to be left in ruins. The Plain Truth magazine has been saying that for nearly 50 years! Even as Allied bombers pounded German cities into rubble, editor in chief Herbert W. Armstrong was writing about the rise and fall of a new Europe. He isn't clairvoyant. He understood a source of information on European history — past, present and future that is ignored by most writers, be they journalists or historical scholars. Yes — it is the Bible. 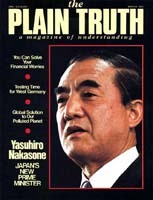 And this magazine was founded to make the truth of the Bible plain. Never before have our readers in Europe needed it more. Keep reading it — whether you receive The Plain Truth. Klar und Wahr, La Pure Verite. Echte Waarheid or La Pura Verdad — the message is the same in all languages. You need this magazine to enhance your thinking for the years that lie ahead. For we will all face big decisions, nationally and as individuals. The Plain Truth has a vital message. It also has some very good news beyond the coming crisis for Europe. For with the same certainty that the Bible predicts a United Europe that will soon rise and fall, it also tells of a new age — beyond the turmoil of the next few years. From the rubble of this coming destruction will rise a world that will last for a thousand years. The nations of Europe and the whole world will join in lending their incredible talents and awesome potential to the building of a society that will be at last fit for all mankind. We call it the world tomorrow. And when we finally learn to beat the swords into plowshares and the spears into pruninghooks, then also we can afford to erase the last remaining evidence of Dachau and Hitler's mountain resort. For only then can the world be sure that the mad will never again guide the destiny of a great nation.